We had a great week at Junior 1 camp and Tot Lot! The weather was beautiful with just a few well-timed thunderstorms. 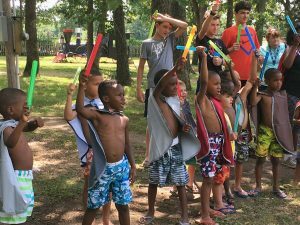 At Big Camp, kids enjoyed a full week of camp activities, including boating, pool and lake swimming, making s’mores, shooting sling-shots, trail hikes, fishing, and crafts. 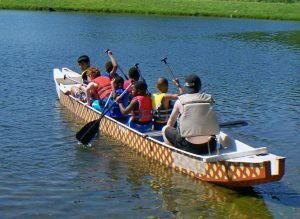 The boys of Pin Oak Left were particularly excited when they were able to go out with Rec staff in one of the new Dragon boats (canoes that can hold a whole cabin-load of kids at one time). The Friday-night carnival was also a big hit with face painting, bounce house, sack races, disc golf, dunk-your-counselors tank, dance-offs and bean bag tosses. The counselors have spent the week building relationships with the kids as they walk through each days’ activities with them, eating meals together, leading them in devotions and praying with them before bed. At Tot Lot, the children have been loved by a team of “Big Sibs,” who pour into the children to provide for physical needs, while prayerfully and empathetically caring for emotional and spiritual needs. A memorable time at Tot Lot was the much-anticipated mid-week, very special, tea party that celebrates the unique traits that God has instilled in the hearts of his sons and daughters. The girls were taken inside where they sat upon a purple “royal” tapestry and drank their tea (Kool Aid) out of fancy glass teacups. 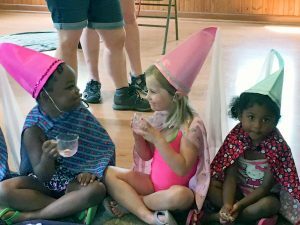 They were fitted with flowing princess hats and listened to a story about God’s big love and incredible purposes for them as daughters of the Most-High King. The boys’ tea time looked starkly different as they embraced “roughing it” outside, but they too learned about God’s plan and purpose for them as royalty and mighty warriors in the Kingdom of God. They were cloaked in heroic capes and sent charging forth with their (bubble) swords raised high. 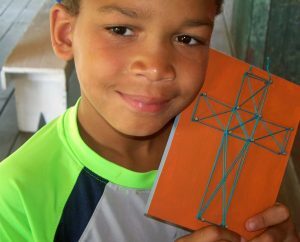 At both Big Camp and Tot Lot, everything is about changing lives through introducing kids to Christ. 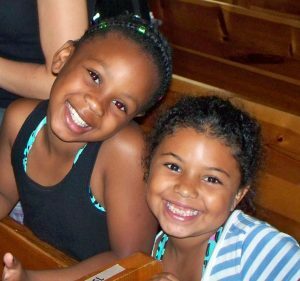 One girl camper at Junior 1 camp this week asked her counselor to pray with her to invite Jesus into her heart. Just as they started praying the girl suddenly called out in alarm to stop. “Wait!” she interjected. “I can’t invite Jesus into my heart yet because it is all dirty!” The girl then asked Jesus to forgive her to make her heart clean and then invited him to live there. In one of the boy cabins this week, a camper who had a lot of behavior problems and had previously treated many of the other campers badly, prayed to accept Christ during devotions on Friday night. After that, on his own initiation, he apologized to the other boys for bullying them, mentioning with tears in his eyes specific instances for which he was sorry. Chapel time is a huge part of teaching kids about Christ, but camp staff does everything they can to weave the story of Christ into every part of the day, whether it be crafts, nature walks, or just daily interactions between the kids learning how to “represent” Christ, as is our theme for camp this year, and be like Christ as we live a life of love.